ARI specializes in customized simulation programs for vessel bridge operations, crane operations, dynamic positioning, machinery operations and many others. In fact, ARI has over 1,000 simulator installations worldwide. 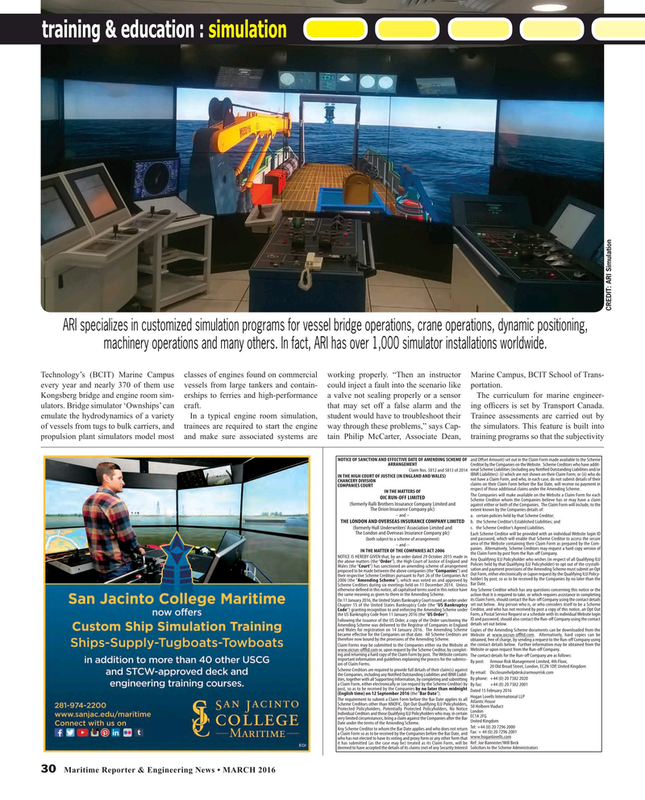 Technology’s (BCIT) Marine Campus classes of engines found on commercial working properly. “Then an instructor Marine Campus, BCIT School of Trans- every year and nearly 370 of them use vessels from large tankers and contain- could inject a fault into the scenario like portation. COMPANIES COURT respect of those addit ional claims under the Amend ing Scheme. THE LONDON AND OVERSEAS INSURANCE COMPANY LIMITED b. the Scheme Creditor’s Estab lished Liabilities; and c. the Scheme Creditor’s Agreed Liabilities. NOTICE IS HEREBY GIVEN that, by an order dated 29 October 2015 made in the Claim Form by post from the Run-of Company. Scheme Creditors during six meet ings held on 11 Decem ber 2014. Unless Bar Date. Amend ing Scheme was delivered to the Registrar of Com panies in England details set out below. Claim Forms may be sub mitted to the Com panies either via the Website at the contact details below. Further inform ation may be obtained from the www.oicrun-oftd.com or, upon request by the Scheme Creditor, by com plet - Website or upon request from the Run-of Company. ing and return ing a hard copy of the Claim Form by post. The Website contains The contact details for the Run-of Company are as follows: import ant inform ation and guide lines explain ing the process for the sub miss - By post: Armour Risk Management Limited, 4th Floor, ion of Claim Forms. Scheme Creditors are required to provide full details of their claim(s) against By email: Oicclosurehelpdesk@armourrisk.com the Com panies, includ ing any Notifed Outstand ing Liabil ities and IBNR Liabil - By phone: +44 (0) 20 7382 2020 ities, toget her with all Support ing Inform ation, by com plet ing and sub mitt ing a Claim Form, either elect ronic ally or (on request by the Scheme Creditor) by By fax: +44 (0) 20 7382 2001 post, so as to be received by the Com panies by no later than mid night Dated 15 February 2016 (English time) on 12 Septem ber 2016 (the “Bar Date”). Date under the terms of the Amend ing Scheme.